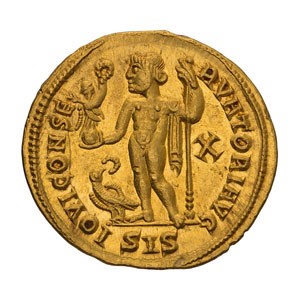 Licinius I. 308-324 AD. Aureus, 5.30gg. (7h). Siscia, c. 316 AD. Obv: LICINI - VS P F AVG Head laureate right. Rx: IOVI CONSE - RVATORI AVG Jupiter standing left holding Victory on globe and scepter, at feet eagle holding wreath in beak, SIS in exergue, X in right field. Unpublished rev. legend var. of RIC 18 (11 spec.) and Depeyrot 16 (p. 101, 17 spec.). FDC. The date 316 AD is deduced from the X in reverse field, which may refer to Licinius' decennalia. 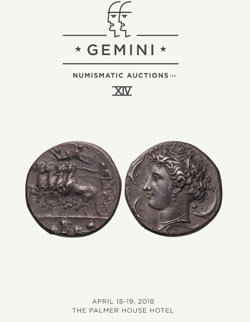 This variant with Jupiter holding Victory on globe rather than thunderbolt and with AVG at the end of the reverse legend is not in the standard catalogues, though there is a similar coin in CoinArchives and another was sold by Ancient Auction House on eBay in January 2007. Cohen 89 (150 Fr.) 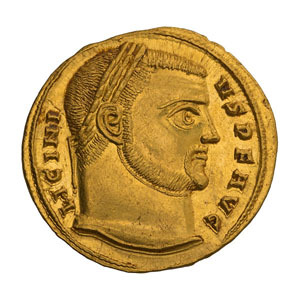 describes an aureus like ours, but apparently only in error, since he cites the Vienna collection, which does not possess such a coin according to RIC and Depeyrot.